I'm not a big fantasy reader, I should say that up front. I'm usually drawn to contemporary books or more urban fantasy settings. But, when I read the description for The Impostor Queen, it really stood out for me. The hero of this story, the future queen, is an impostor? She's not really the 'chosen one'? Definitely not something you read everyday. Even with the unique concept, I kept expecting this book to fall into a typical fantasy plot line but it never did. It surpassed all my expectations and reminded me just how rich and wonderful high fantasy books can be. The pacing of the novel was a little back and forth. It started off slow, then really picked up and then slowed back down again. But, I didn't mind. I was invested in this story and was happy to be tugged along at whatever pace it went. I know this might be an issue for some people but seriously, it's worth the back and forth. This book is just so interesting. As I don't like to talk about any spoilers on the blog, I won't go into details about the plot. But I will say that I loved it. The magic and mystery, the folklore and fantasy all tied together into this intricate plot line that had me entranced. As I said earlier, I don't read high fantasy very often and I forgot just how long it takes me to read. It has nothing to do with the book itself, but the world-building as a whole always takes my brain so long to digest. But, once I was immersed in this world I didn't want to leave it. I kept thinking about the plot and the characters and couldn't wait to dive back in. I named this blog after those reads that keep you up past midnight, and this was definitely one of them. I kept telling myself "just one more chapter!" until I looked at the clock and realized I should have been in bed hours ago. It took me a little while to warm up to Elli, I won't lie. Although I adored how inquisitive and curious she was, I wasn't really sure what to make of her. She was so sheltered at first and it was intriguing to watch her grow into this powerful woman. She was determined and strong, always wanting her earn her place and fit herself into this new world. By the end of the novel, I wanted to reach in and give her a high-five. She was just such a great character. Then, there's Oskar. Strong, quiet, courageous Oskar. I knew as soon as he appeared on the page I was going to love him. There are so many incredible things about Oskar, and about his relationship with both Elli and his family. But, the biggest reason I adored Oskar is because of his belief in Elli. He supported her, trusted her, and encouraged her. He believed in her even when she doubted herself. And THAT is something I love to see in a relationship. Seriously, I cannot wait to see where Oskar and Elli go in the next installment! The other character I'll touch on is Sig. I found Sig to be such a fascinating character. I never knew what he was going to do, or whose side he was truly on. He was charismatic, but also villainous and I was glued to the page whenever he was on it. Characters who straddle the line between good and bad are always my favourites. And, as much as the things Sig did made me angry, he was definitely a stand out character to me. I'm going to be anxiously awaiting the sequel to this one. Seriously, I would like to have the book in my hands as soon as humanly possible because I'm not ready to be out of this world. It's been a long time that I was THIS excited about a series and I really hope we get more soon. 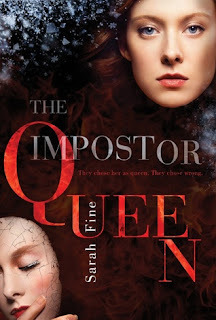 Check out The Impostor Queen! It's a fantasy not to be missed!